BACKGROUND: Survival rates for children diagnosed with Burkitt lymphoma (BL) in Africa are far below those achieved in developed countries. 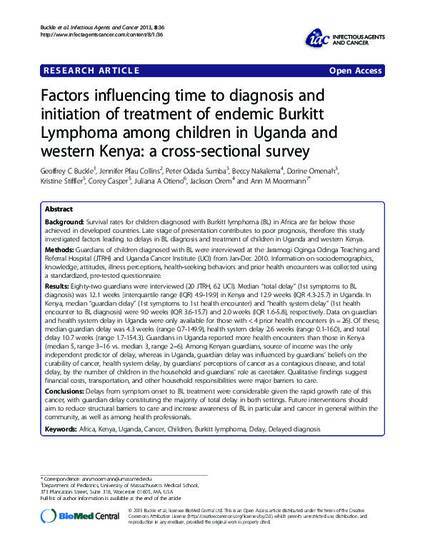 Late stage of presentation contributes to poor prognosis, therefore this study investigated factors leading to delays in BL diagnosis and treatment of children in Uganda and western Kenya. METHODS: Guardians of children diagnosed with BL were interviewed at the Jaramogi Oginga Odinga Teaching and Referral Hospital (JTRH) and Uganda Cancer Institute (UCI) from Jan-Dec 2010. Information on sociodemographics, knowledge, attitudes, illness perceptions, health-seeking behaviors and prior health encounters was collected using a standardized, pre-tested questionnaire. RESULTS: Eighty-two guardians were interviewed (20 JTRH, 62 UCI). Median "total delay" (1st symptoms to BL diagnosis) was 12.1 weeks [interquartile range (IQR) 4.9-19.9] in Kenya and 12.9 weeks (IQR 4.3-25.7) in Uganda. In Kenya, median "guardian delay" (1st symptoms to 1st health encounter) and "health system delay" (1st health encounter to BL diagnosis) were 9.0 weeks (IQR 3.6-15.7) and 2.0 weeks (IQR 1.6-5.8), respectively. Data on guardian and health system delay in Uganda were only available for those with < 4 prior health encounters (n = 26). Of these, median guardian delay was 4.3 weeks (range 0.7-149.9), health system delay 2.6 weeks (range 0.1-16.0), and total delay 10.7 weeks (range 1.7-154.3). Guardians in Uganda reported more health encounters than those in Kenya (median 5, range 3-16 vs. median 3, range 2-6). Among Kenyan guardians, source of income was the only independent predictor of delay, whereas in Uganda, guardian delay was influenced by guardians' beliefs on the curability of cancer, health system delay, by guardians' perceptions of cancer as a contagious disease, and total delay, by the number of children in the household and guardians' role as caretaker. Qualitative findings suggest financial costs, transportation, and other household responsibilities were major barriers to care. CONCLUSIONS: Delays from symptom onset to BL treatment were considerable given the rapid growth rate of this cancer, with guardian delay constituting the majority of total delay in both settings. Future interventions should aim to reduce structural barriers to care and increase awareness of BL in particular and cancer in general within the community, as well as among health professionals. Copyright 2013 Buckle et al. ; licensee BioMed Central Ltd. This is an Open Access article distributed under the terms of the Creative Commons Attribution License (http://creativecommons.org/licenses/by/2.0), which permits unrestricted use, distribution, and reproduction in any medium, provided the original work is properly cited.